Unwind in the scenic surroundings of family run Dromhall Heights B&B, County Kerry. A seven-minute stroll from the bustling town of Killarney, guests can enjoy an evening’s entertainment in Ireland’s premier performing venue the INEC and embrace Kerry’s famed rugged scenery in the magnificent Killarney National Park. Host Peggy McCarthy has been welcoming guests to her home for almost 40 years and pampers them with complementary therapies and home baking. Tours of Dingle, the Gap of Dunloe and the Ring of Kerry can be arranged for guests in addition to jaunting car trips of the lakes and National Park. 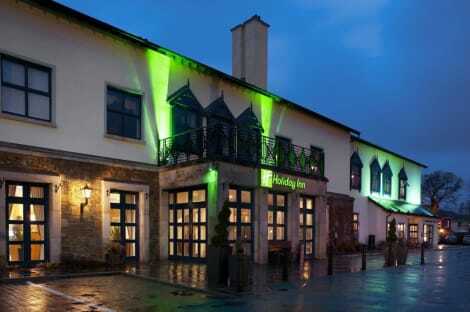 A modern Killarney hotel on the Ring of Kerry with a bar and restaurant, sauna, Jacuzzi and free Wi-Fi Holiday Inn® Killarney hotel marries location and comfort on the eastern side of the Ring of Kerry. Killarney National Park is just around the corner, and Muckross House, Gardens and Traditional Farms and Ross Castle are both less than 10 minutes' drive from the hotel. Killarney train station, just next to the bus station, is 15 minutes away on foot for direct connections around Ireland. An easy 20-minute drive from Kerry Airport (KIR), guests can take advantage of the time saved in transit to visit the Emerald Isle surrounds. You can park and hike to the cascading hydro-magic of Torc Waterfall, just south of Muckross Lake, or trek up mountains, bike through forests or ride horses near one of Killarney's three lakes. Free Wi-Fi is available to all guests, so those who need to catch up on a bit of work can do so with ease. Ample free parking is available as well. The hotel's Saddler's Pub is a great place for an informal work meeting over drinks. The hotel has swimming pools for both children and adults, and the Jacuzzi, sauna and steam room will keep you limber and warm. The hotel's Library Point Restaurant is an inviting spot for breakfast or dinner, and it also has a kids' menu. Kids stay and eat free. Only a 5-minute walk from Killarney town, the newly refurbished Woodlawn House is set in a peaceful location with panoramic views of the Kerry Mountains. The Lakes of Killarney are just a 15-minute walk away. The spacious and recently redecorated bedrooms include a TV, tea/coffee facilities and free high-speed WiFi. Rooms also include an en suite bathroom, hairdryer, radio, and dressing table. The extensive breakfast menu is all freshly prepared and cooked to order. Guests can relax in the lounge, with its open fire, guest computer and printer, and TV. A selection of DVDs and board games are also provided. Woodlawn House can be used as a touring base for the Ring of Kerry and the Dingle Peninsula. Woodlawn House can arrange sightseeing tours and local activities, and share their extensive local knowledge. Free on-site parking is available. Murphy's of Killarney offers spacious en suite rooms and 2 cosy bars all in the heart of Killarney, close to rail and bus services and shopping areas. The newly refurbished Murphy's is also home to Lord Kenmare's Restaurant, which serves modern Irish cuisine and a good wine list. Murphy's Bar serves good food all day, and offers traditional lively music. Squires Bar has a modern yet cosy atmosphere. Killarney National Park is easy to access. Don't miss out on recreational opportunities including a spa tub and a fitness center. Additional amenities at this hotel include complimentary wireless Internet access, concierge services, and babysitting/childcare (surcharge). Getting to nearby attractions is a breeze with the area shuttle (surcharge). Don't miss out on recreational opportunities including an indoor pool and a fitness center. Additional features at this hotel include complimentary wireless Internet access and babysitting/childcare (surcharge).